New to Raven? Not sure what you should do first? This article will help guide you through the first steps of setting up your account, from creating a new Campaign to building an automated report. Looking for a more general overview of Raven? Learn at your own pace with recorded videos. Before you do anything else in Raven, you'll first need to create a Campaign. Campaigns store all of the data and reports for a given website, making organizing your data for a particular client simple. To create a new Campaign, click the Campaigns dropdown menu and select Add Campaign to open Setup Wizard. If you're working from a brand new Raven account, you'll already be in the Setup Wizard — no need to click anywhere else. Enter a URL for your Campaign. As a general rule, go with the version of the website that is most commonly used for your marketing purposes. Redirecting from www.domain.com to just domain.com? Use domain.com! Connect some data sources! We'll cover this in the next step, but if you want to get a jump on adding Google Analytics, Google Ads, Twitter or Facebook data to your Campaign, you can add them here. Click Submit to finish creating your Campaign. Simple! If you're managing social media profiles, but not a full-scale website, we recommend entering your client's website URL. You can always change the Display Name of the Campaign in Campaign Settings. Connect all of the things! Now that you've created a Campaign, it's time to start filling that Campaign with data. One of the greatest benefits to using Raven is being able to see data from more than a dozen different services all in one location. Google Analytics: The backbone of your website analytics, Google Analytics isn't just about sessions and visitors — it's about driving those visitors to accomplish goals on your website. Search Analytics: Raven provides keyword ranking data directly from Google, with the same flexibility of what you Search Console. No more leaving it up to data scrapers, Search Analytics provides the most accurate ranking data available. 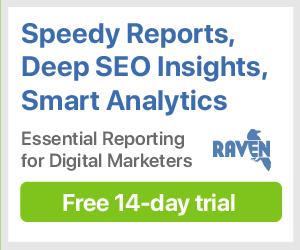 Facebook: If your client or company uses Facebook to communicate with its fans, you can use Raven to schedule posts and track engagement metrics. Twitter: Raven provides Twitter metrics that start gathering 24 hours after you connect your Twitter account. Using Twitter? Make sure to connect this ASAP for the most data possible. That's just the tip of the iceberg for what you can connect in Raven. Did you know that every tool allows you to connect multiple accounts at once? It's true! Just click the Connect button wherever you're at and you'll get a whole list of possibilities. Now that your external data is starting to populate in Raven, why not give Site Auditor a spin? Site Auditor scans through every page of your website, looking for errors and optimization opportunities. It can take some time to Site Auditor to finish, so start it now and we'll let you know when it's finished. Not sure where to start with Site Auditor? Check out this guide! Competitor Manager allows you to specify who your competitors are and track their progress against your own. This doesn't just happen in Competitor Manager — you can see your competitors' comparative data in Site Performance as well. To get started, just add some competitors in Competitor Manager, as explained in this article. Pro Tip: Looking for even more data on both your client and your competitors? Try checking out Research Central for more in-depth data on backlinks, keywords, quality and much, much more. Added a bunch of data? Ran your first Site Auditor crawl? Scoped out the competition? Great! Sounds like you're ready to create a report. Check out this guide for step-by-step instructions on how to add Sections and Widgets to a one-off or scheduled report. In general, we recommend conceptualizing what it is that you want your clients to see and working backwards from there. How do you want to prove the value of your services to your clients or your boss? Is it an increase in Twitter followers? Improvements in conversion rate? A jump in traffic, clicks or average rank? All of the data is at your fingertips — you just have to figure out what you want to communicate. Once you've built your perfect report, don't forget to set it as a template, so that you can re-use it on your other Campaigns.